8-10 tomatoes, sliced thick, I get 4 slices for each tomato, fill a sheet pan in a single layer. Arrange the tomatoes on a sheet pan, cut sides up, in a single layer. Drizzle with olive oil, Sprinkle the garlic, sugar, salt, and pepper over the tomatoes. 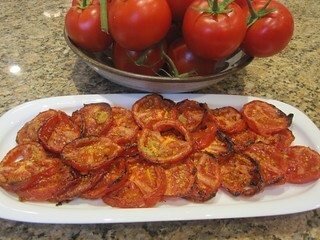 Roast for 25 to 30 minutes, until the tomatoes are concentrated and beginning to caramelize. Serve warm or at room temperature. serve with fresh bread and your favourite hummus.